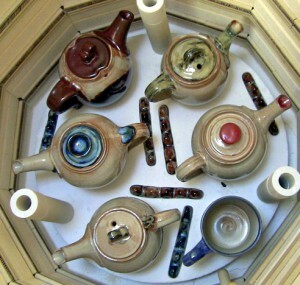 Here are some teapots from yesterday’s kiln opening; I couldn’t help feeling pleased with the results! In the past I’ve tended to shy away from making teapots as previous attempts have ended in disappointment. The individual components need to be right in their design in order to bring a pot together in terms of it’s overall character. Getting character into a teapot is a most important aspect for me personally, but it also has to function well. A tall order! Having gotten as far as getting both character and design right, I was then often let down by the glazing – not because anything was wrong with my glazing efforts, but because things would happen. All too frequently the lids would get permanently stuck on, or the filtering holes would get clogged with glaze so that the tea couldn’t be poured out. Then there was the slop, slop, piddle! After all that effort it seemed easiest to not make teapots anymore. I didn’t believe that I could ever make them properly but recently something stirred within me and it was time to give it another go. Acting on impulse I took the mind-set of determination to give it my fullest attention and found myself to be immensely absorbed by creation and thoroughly enjoying it. I let go and allowed things to flow. When it came to glazing, I went ahead with confidence having drawn on lessons learned from the past before finally placing the teapots on the bottom kiln shelf to be fired; not giving them a second thought during firing since my main concern was about some mugs that were in there for a customer’s order. The kiln was unpacked yesterday. I removed the second shelf and found the teapots beneath looking very promising indeed. One by one I took them out for close inspection and was delighted to find the lids were removable, all filtering holes were free from glaze, and they poured! I guess fortune favours the brave, along with a little old fashioned grit and determination thrown in for good measure.